You would think if you shine a light through a barrier with two slits in it that the wall on the other side would show two slices of light. This is not what happens, however, as Thomas Young discovered in the early 1800s. Rather than two distinct lines it created an interference pattern, indicating light behaved like a wave. You can get a better understanding of interference as it relates to wave behavior by dropping a pebble into a puddle and watching how the waves expand in a circle from the center point. Then drop two pebbles at the same time a few inches apart and watch how the waves interact. What results is called constructive and destructive interference as some waves get bigger and others cancel out. This is similar to the interference pattern of light which leaves dark spaces alternating with light bands which create a striped effect. But as scientists continued messing around with the properties of photons, inconsistencies appeared. In 1887 Heinrich Hertz discovered that light could stimulate electrons on a metallic surface and thus create electrical current but the effect was related to the frequency of the light. In 1905 Albert Einstein explained that this was because light energy was carried in discrete, quantized packets and eventually won the Nobel Prize for it in 1921, which was the beginning of the quantum revolution. As theorized by Isaac Newton and believed throughout the 1700 – 1800s, this supported the theory that light consisted of particles which were called photons. The particle theory made sense since it had been discovered that a photon absorbed by an atom increased its energy level and when it dropped its energy state then a photon was emitted, showing a release of energy. When photons interact with matter they act like tiny particles. So what was going on? Was light a particle or a wave? It was in pursuing the answer that quantum theory was further established as scientists continued to study the results of the double-slit experiment. 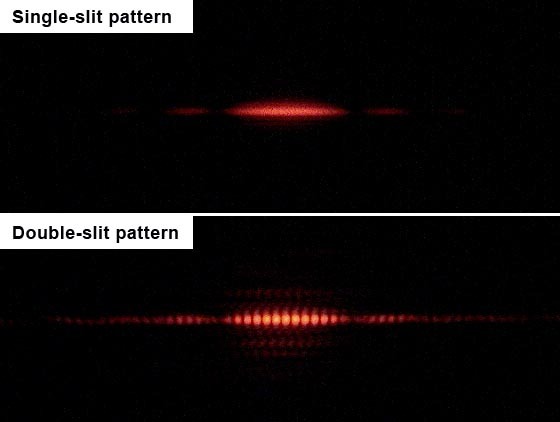 When laser light is passed through two tiny slits it forms what is called a diffraction pattern on the other side, similar to what Thomas Young saw back in the early 1800s and is shown in Figure 2. This behavior supports the idea that light is a wave since particles would not arrange themselves in such a way. This led to the idea of a probability wave meaning that the photons would land somewhere within a given area with some places more likely than others. But this completely blew the idea of prediction out of the water which was the premise of classical physics and presumed if you knew all the conditions involved you could predict the outcome. Suddenly science was having to deal with probabilities, or the likelihood of subatomic particles behaving in a certain way, as opposed to being able to calculate the precise answer when they knew all the parameters. Ooops! With that revelation, classical, i.e. Newtonian, physics went out the proverbial window. It obviously couldn’t solve any problem and most certainly couldn’t predict future events. This, in turn, eventually influenced the philosophy of the day regarding life and the concept of free will. The implications suggested that while some outcomes were more likely than others, exactly which one it would be was no longer possible to determine. As if the dual nature of light wasn’t mysterious enough, it soon became even stranger when someone was watching. This entry was posted in Physics Explained and tagged Albert Einstein, classical physics, double slit experiment, free will, Heinrich Hertz, Isaac Newton, Newtonian physics, photoelectric effect, photons, physics, probability wave, properties of light, Thomas Young by Marcha's Two-Cents Worth. Bookmark the permalink.